The KS12 is a one size fits all knife sheath. It is made of heavy SBS paper and sealed at one end. 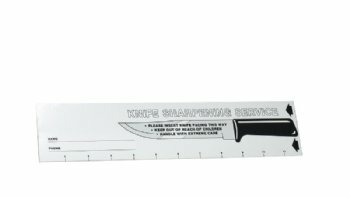 To put a knife into the KS12 simply squeeze its edges to open it and carefully slide the knife blade and handle into the sheath. With larger knives only the knife blade goes into the sheath. The printing on the KS12 includes one inch increments and a place for customer name and telephone number. Dimensions: length 12"(30.5 cm) x width 2 5/8"(6.7cm).